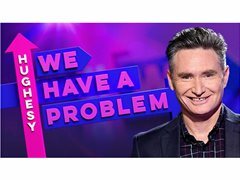 TV & Reality Jobs>Audiences Wanted>Audience Needed or "Hughsey, We Have a Problem"
Dave Hughes hosts Australia's hit comedy TV show, and you can be part of the studio audience! Hughesy, We Have a Problem brings together the biggest names in comedy and entertainment for a truly noble cause: to help the people of Australia get over life’s infuriating problems. Each episode, Hughesy is joined by four celebrity guests who offer searingly honest and hilarious insights as they help untangle the messiness of modern life. From how to handle infidelity to solving who gets to hold the television remote, there is no problem too big, small, funny or difficult for Hughesy and the team to tackle. Hughesy, We Have A Problem will be filming at Channel Ten Studios in Pyrmont with Morning & Afternoon sessions. Tickets are first come first serve, and you must receive a confirmation e-mail in order to check in.